Okay, these little minis are really little brothers to my German Chocolate Pie with a few changes. What I love about these is that they’re fast, single-serving pies with plenty of crust and room for topping. And rather than “accidentally” having 1/5th or 1/6th of a whole pie (I’m sure I’ve never done that. Never!) you get exactly 1/16th but it’s incredibly satisfying. I still want to try one of the artificial sweeteners in place of the sugar to see if I can get this to a delicious, decadent dessert with one-third less guilt. Maybe next time. Melt chocolate and butter together using your preferred method. I use the microwave, myself. Stir in evaporated milk and set aside. Mix together sugar, cornstarch and salt, then add the egg and vanilla. Whisk in chocolate, then stir in pecans and coconut. Set the pie shells on a baking sheet. Pour filling in to the edge, you should just enough for 8. Bake for 20- 25 minutes. They should be browned and not very jiggly at all. Cool for 2+ hours to room temperature then refrigerate overnight. 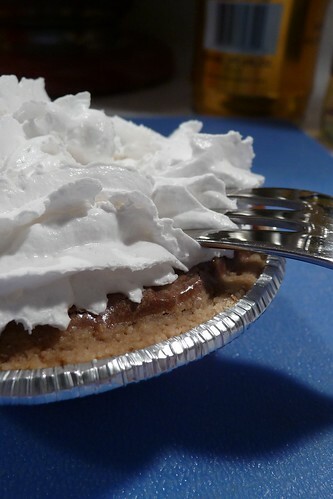 Serve topped with whipped cream and chocolate shavings. This entry was posted in american, pie, recipes, snack, untranslated. Bookmark the permalink.